“She is winter. Whispering white. Clear air. Silent peaks. Crispness. A primal hug with Mother Earth As I carve around her. No asphalt, concrete trucks No manufacturing lines of Japanese workers building automobiles. Just me, the mountains, and Extensions to my body. “Active and passive, Breezy melody on the way up The ski lift sways over tree tips The snow dances with the wind And rhythm down the hill Down, turn, carve, up, down, turn carve up A smooth music and easy flow The soft white soil below Responds like skin to the touch of a finger Loving you back. “Warm body on a cold day Apres ski pervades the collective soul Red noses share a glass And the adrenalin of the slopes. Soaking the marvel of Mother Earth Enveloped in warm water Bubbling upwards under sparkling stars Fire and ice Warm glow and rising smoke Families cackle around games A milky moon in the inky sky Caresses me as I give myself up Every reason to do it all again The next morning. “Anjana got run over by a snow-boarder, Skiing at Heavenly New Years Eve, She may not believe in helmets, But as for the Datt family, we believe. “She was wearing an owl hat To protect her head from cold, But she forgot that a helmet will protect her head from getting rolled. “After Anjana was all wrapped up, All protected in her sled, Her husband Derek did the right thing, And lectured the boy instead of hitting him in the head. “After some x-rays and a CT scan We found she has a brain, Luckily no long-term damage affected it So the fears of her family were in vain. “Now that Anjana’s feeling better, We all hope that we will hear, That wearing a helmet is better, Than a few days of headache and ringing in her ears. 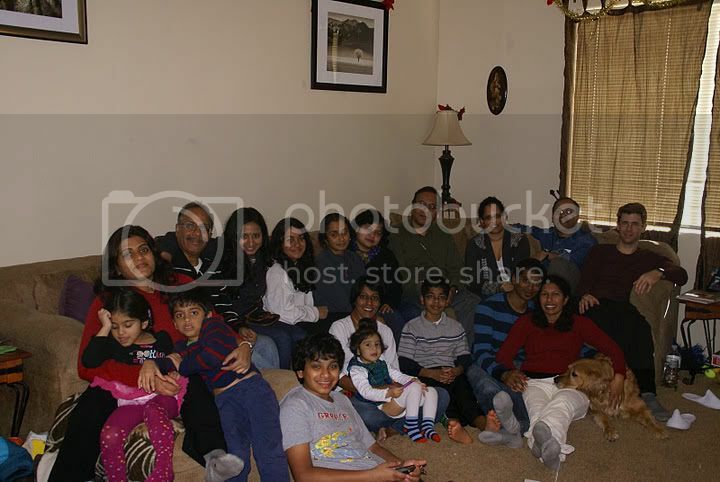 Only five of us…KM’s elder brother Natarajan and his wife Bhuvana, Narayan’s wife Bhavadharini, and KM and I…are missing.